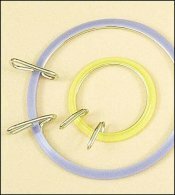 Spring Tension Hoops. 5 Round Hoop  - $3.76 : Yarn Tree, Your wholesale source for cross stitch supplies. Item 3253. 5" Round Spring Tension Embroidery Hoop. Quick and easy to use. Since it goes on and off so easily, your stitchers will be more likely to move the hoop around--resulting in less chance of “hoop marks”.